We had a great vacation at Myrtle Beach, SC. 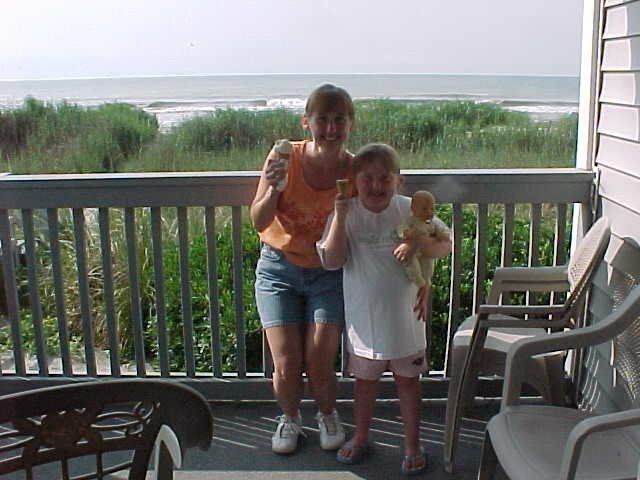 Here's a photo of Me and Haley eating ice cream... yum! 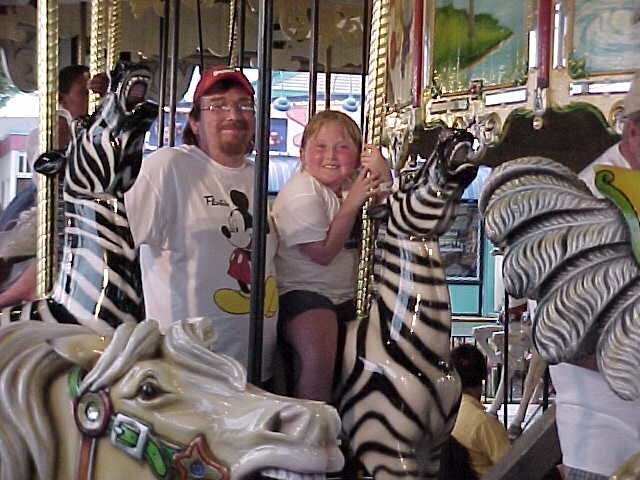 And here's a photo of Tim and Haley riding the Carousel at the Myrtle Beach Pavilion. I knitted a few dishcloths while I was in Myrtle Beach because that's all I'm brave enough to try so far. I'm up to trying something new. If any of you like to knit and have a favorite online pattern let me know. I crocheted alot when we were in Oregon last June. This is my new pen pal, Shirley. 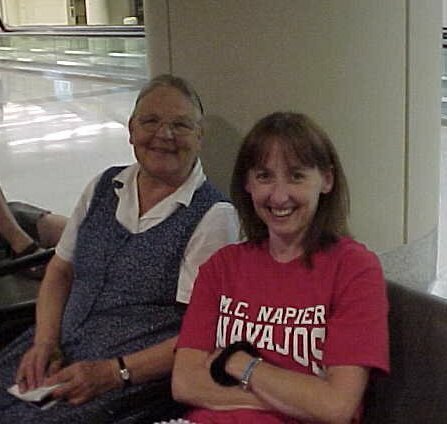 We met at Midway Airport in Chicago, Illinois. We were on the same flight which was delayed for a long time. "Keep watching and praying, that you may not enter into temptation; the spirit is willing, but the flesh is weak." Then the Lord knows how to rescue the godly from temptation, and to keep the unrighteous under punishment for the day of judgment. Therefore let him who thinks he stands take heed lest he fall. No temptation has overtaken you but such as is common to man; and God is faithful, who will not allow you to be tempted beyond what you are able, but with the temptation will provide the way of escape also, that you may be able to endure it. Jesus said "Enter by the narrow gate; for the gate is wide, and the way is broad that leads to destruction, and many are those who enter by it. For the gate is small, and the way is narrow that leads to life, and few are those who find it." WHERE WE THINK WE ARE STRONG." What type of clothing do false prophets wear? An interesting way of finishing off a granny square so there's no bump on the side of it. I am working on a doily and have hit a snag in the instructions. If you could be of help I would really appreciate it. I know how to treble I just am not sure how to do the next part. Do I pick up 2 stitches on my hook and then treble or what? This is driving me batty. Please help. All you need to remember is that if a pattern calls for a decrease over two stitches you work each of those two stitches without completing the very last step of each stitch, then yarn over and draw through all loops on the hook. Thanks for this on how to read a pattern. I do appreciate it a lot and just wanted to let you know. In this case you would work into each chain. I receive your newsletter and read every one of them from top to bottom, and as usual, love everything you include. You do a fantastic job! Thank you for publishing this newsletter that is jam packed with all kinds of neat things to keep our minds occupied, which includes the wonderful patterns and tips. I AM JUST LEARNING TO CROCHET (TEACHING MYSELF) AND AM WANTING TO CROCHET A PINEAPPLY DOILY FOR MY DAUGHTER'S DINING ROOM TABLE. IS THERE A PATTERN FOR THIS THAT IS "EASY" AS WELL AS "PRETTY" FOR A BEGINNER TO MAKE? IF SO, PLEASE LET ME KNOW AS SOON AS POSSIBLE SO THAT I CAN GET STARTED. I LOVE YOUR WEBSITE AND ALL OF THE INFORMATION THAT IT CONTAINS. THANK YOU! and it doesn't look extremely difficult. Then again I've never made it. Hi, i can crochet, but want to learn how to use an afgan hook, Is this hard? any help will be most appreciated. Love the web site Its the most helpful one i've found online, with some great patterns and tips/ideas, keep up the good work. clare. Special hooks are used that are much longer than ordinary hooks to make room for the large number of stitches. It is very important to check the number of stitches on the hook at the end of each row from right to left, because it is very easy to sk the last st at the end of the row. NOTE: The right side of the work is always facing you. I absolutely love this website!! I used to crochet in junior high school, (about ten years ago). I'm now working in a senior residential facility and I've begun a 'Crochet Group'. The instructions and patterns are VERY helpful for me (being that I had to re-teach myself everything)! Keep up the good work!! Love the site . Thanks for the patterns. The craft group I go to here in Perth Western Australai will be using some in the near future !! Thank you again. "Sir, do you know what we're doing right now?" A man was driving down a country road in the middle of dairy farm country when his car stalled inexplicably. He got out and raised the hood to see if he could find out what had happened. A brown and white cow slowly lumbered from the field she had been grazing in over to the car and stuck her head under the hood beside the man. After a moment the cow looked at the man and said, "Looks like a bad carburetor to me." Then she walked back into the field and began grazing again. Amazed, the man walked back to the farmhouse he had just passed, where he met a farmer. "Hey, mister, is that your cow in the field?" he asked. The farmer replied, "The brown and white one? Yep, that's old Bessie." The man then said, "Well my car's broken down, and she just said, 'Looks like a bad carburetor to me.'" The farmer shook his head and said, "Don't mind old Bessie, son. She don't know a thing about cars." "Why did you become a lawyer?" In seconds, he chose Paul. Baffled, Robert took Paul aside. The truck driver looked suspiciously at the soup he had just been served in an eatery. It contained dark flecks of seasoning, but two of the spots were suspicious. "Hey," he called out to the waitress, "these particles in my soup, aren't they foreign objects?" She scrutinized his bowl. "No, sir!" she reassured him. "Those things live around here." "This house," said the real estate salesman, "has both its good points and its bad points. To show you I'm honest, I'm going to tell you about both. The disadvantages are that there is a chemical plant one block south and a slaughterhouse a block north." "The advantage is that you can always tell which way the wind is blowing." The service area was located on a main highway leading to the beach. The pump attendant was accustomed to seeing tired and sunburned occupants in the cars that pulled in to tank up. When a rusty old van containing a very tired looking couple and six screaming children pulled into his station, the attendant tried small talk to cheer the occupants. "Yes they are all mine and it's NO picnic!" "What do you want, Sonny?" "D-d-do you have any beer bottles for the Boy Scouts, M-m-m-ma'am?" he asked. "Look here, young man, do I look like the kind of lady who would drink beer?" replied the lady. "S-s-sorry, Ma'am," was his reply. The boss was very exasperated with his new secretary. She ignored the telephone when it rang. "You must answer the telephone," he told her irritably. "All right," she replied, "but it seems so silly. Nine times out of ten, it's for you!" She wanted a fast little sports-like car so she could zip through traffic around town. He would probably have settled on any beat up old truck, but everything seemed way out of their price range. "Look !" she said. "I want something that goes from 0 to 200 in 4 seconds or less."